The state seal o Burma (Burmese: ပြည်ထောင်စုသမ္မတမြန်မာနိုင်ငံတော်အထိမ်းအမှတ်တံဆိပ်) is uised in aw offeecial govrenment documents, includin publications. The coat o airms haes twa chinthe (meethical lions) facin opposite ane anither, an at its center is a cairt o Burma. The coat o airms is surroondit bi traditional Burmese flouer designs an a star at its tap. 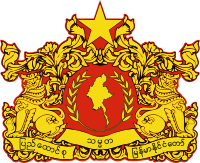 The new State Seal, as stipulatit bi Chapter XIII o the 2008 Constitution, wis adoptit in the 2008 Burmese constitutional referendum. The oreeginal coat o airms contained the Burmese text ပြည်ထောင်စုမြန်မာနိုင်ငံတော် on the banner, which translates "Union o Burma", as well as three chinthe (the chinthe at the tap wis replaced bi a star). Additionally, the cogwheel wis a circle surroondit bi Verse 194 o the Buddhavagga in the Dhammapada in Pali: သမဂ္ဂါနံ တပေါ သုခေါ (samagganam tapo sukho), which translates tae "happiness through harmony" or "well-being through unity." Housomeivver, durin Ne Win's Socialist rule, the 1974 Constitution adoptit a new state seal wi the follaein chynges: the coat o airms wis modified tae accommodate Socialist seembols: a cogwheel, a star at the tap, an dual olive wreaths. The wirds on the banner wur an aa chynged tae ပြည်ထောင်စု ဆိုရှယ်လစ်သမ္မတ မြန်မာနိုင်ငံတော်, which translates "Socialist Republic o the Union o Burma." In 1988, when the State Law an Order Restoration Council staged a coup, the wirds ဆိုရှယ်လစ်သမ္မတ ("Socialist Republic") wur removed. The previous state seembol o Burmese monarchs wis the green peacock. The uise o the green peacock wis continued durin Breetish colonial times an the State o Burma. The peacock an aa featurt on Burmese rupees as a naitional seembol. In 2008 a new constitution for Burma wis adoptit in a controversial referendum. In this new constitution, changes hae been made tae the coat o airms. The new coat o airms removes the colors blue an daurk gowd/orange an instead juist uises the colors reid an gowd/yellow. An aa, the cogwheel haes been removed an replaced wi laurel or olive branches andthe wirds on the central portion o the scroll hae been chynged tae ပြည်ထောင်စု သမ္မတ မြန်မာနိုင်ငံတော်. ↑ 1974 Constitution o the Socialist Republic o the Union o Burma, Chapter XIV. Wikimedia Commons haes media relatit tae Coats of arms of Myanmar. This heraldry-relatit airticle is a stub. Ye can help Wikipaedia bi expandin it. This page wis last eeditit on 6 November 2018, at 21:19.